This month, Altenew have the gorgeous Build-A-Flower: Morning Glory! 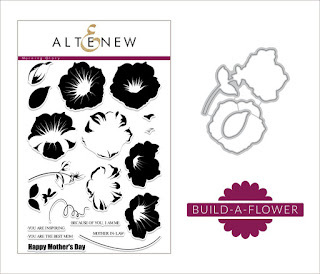 I am so excited to be a guest designer this month and I have two cards for you with a new Build-A-Flower Set. 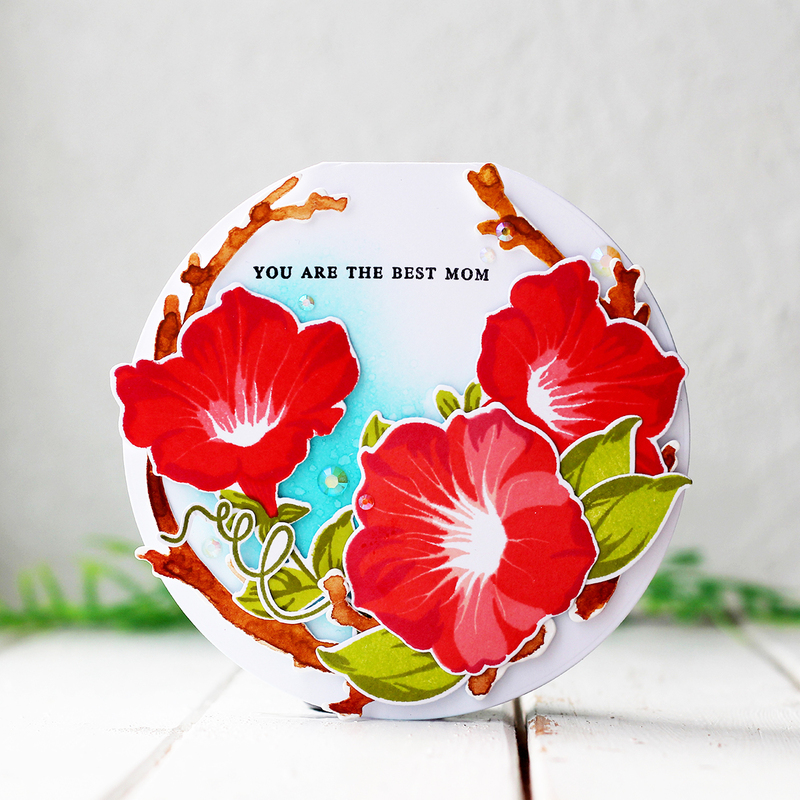 I started working on my card by stamping the flowers using Cool Summer Night Oval Ink Set and the leaves using Tropical Forest Oval Ink Set and cut out all of the images. To create the background panel I decided to use grey cardstock. I find it so stylish. So I used the Rock Collection Oval Ink Set on the background to make the shadows of the flowers. 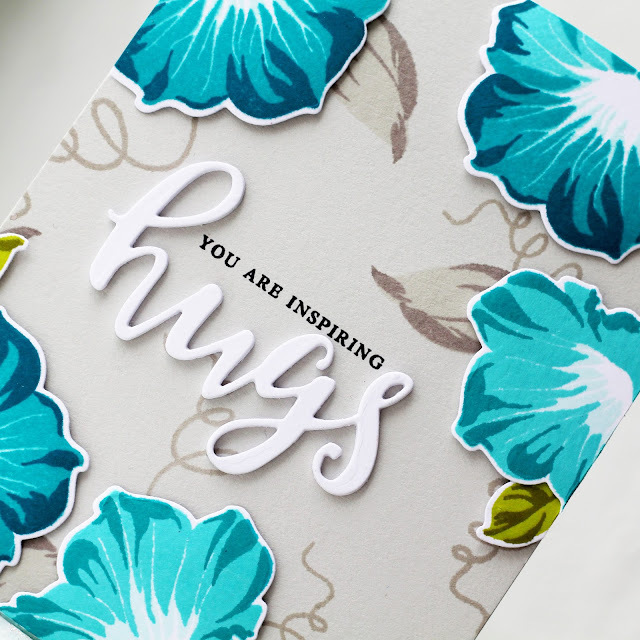 After my background was done, I added "You are inspiring" and "Hugs" (I've die cut it using one of the Script Words Die Set ) sentiments. This finished up the card! Recently, I really like to create a circle card base for my projects. It looks so unusual! For this card I stamped the flowers using Tea Party Oval Ink Set and the leaves using Tropical Forest Oval Ink Set. Then I made the background blending Caribbean Sky Crisp Dye Ink on the white paper. For my composition I also added two twigs from the Forever and a Day Die Set. Next, I foam mounted my images and also stamped a sentiment –You are the best MOM. And embellished this project using some crystals. 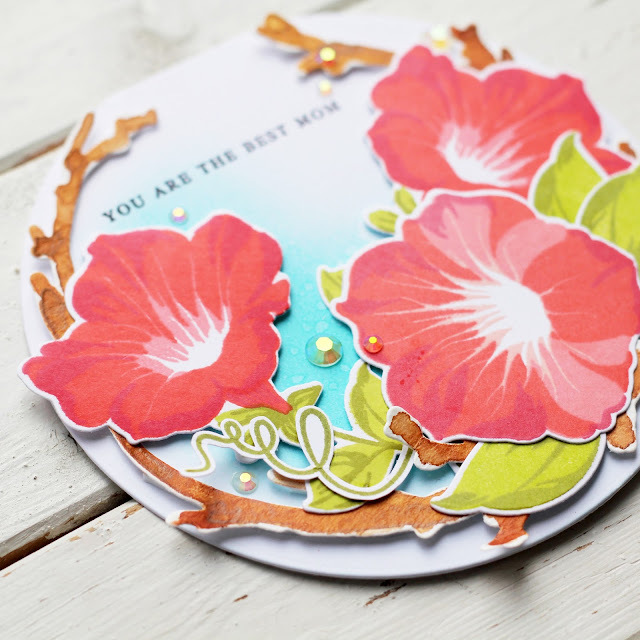 Your Morning Glory cards are beautiful! Beautiful morning glory cards, I love the soft gray background for the vibrant teal/blue flowers and the tropical orange/coral on the circle card are stunning. What beautiful cards Olga. I really love shaped card so this one really appeals to me, BIG time! So Beautiful! The color layering looks amazing! I adore the teal color combo! Such an amazing stamp set and you created such beautiful cards. Love the dimension on these cards! I love the gorgeous colors you used for the 1st card. And I love shaped cards, so cute! And yours is just beautiful; love all the little details. Beautiful cards! I love morning glories. What beautiful flowers! Love the vivid red and blue colors. Gorgeous cards! Another great stamp set. Both of these are PHENOMENAL! Love these flowers, and the colors you chose really make them stand out. Stunning and dramatic! Thanks for the inspiration! Beautiful cards. I love this set. Gorgeous creations! These morning glories are spectacular! I LOVE the red ones! Your cards are so beautiful, I love it!!! Gorgeous cards! Love your beautiful compositions and vibrant color combinations. Stunning cards! 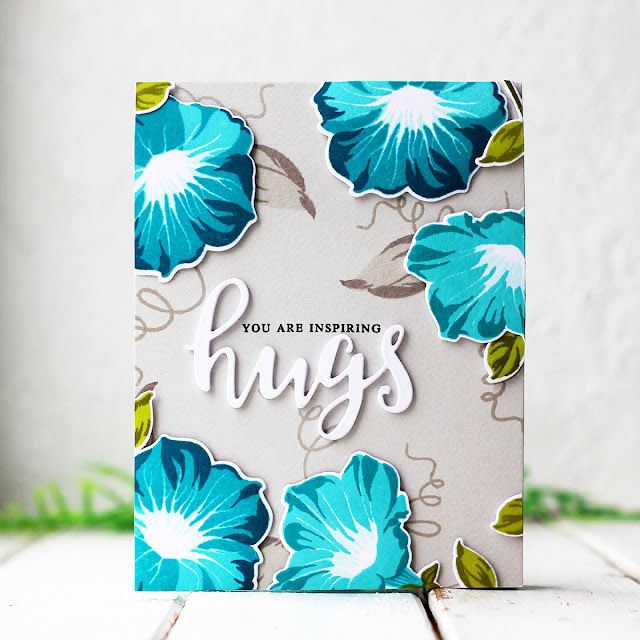 The aqua blue flowers on the gray cardstock is a beautiful combination, and the red flowers are just gorgeous! Love both of your cards! Very beautiful cards. Both are really gorgeous! Beautiful cards! Love the bright bold colors you used for the flowers. Wonderful creations, I especially love the round card! Absolutely breathtaking cards! Brilliant colors and placement. TFS! Gorgeous cards! I love the colors you used, especially the blues! Thanks for the inspiration! This is another gorgeous layering flower with beautiful details. Love your card designs. Absolutely beautiful, Olga! Love the pretty blue against the gray! Olga, thanks for sharing these two cards. They are both so lovely. 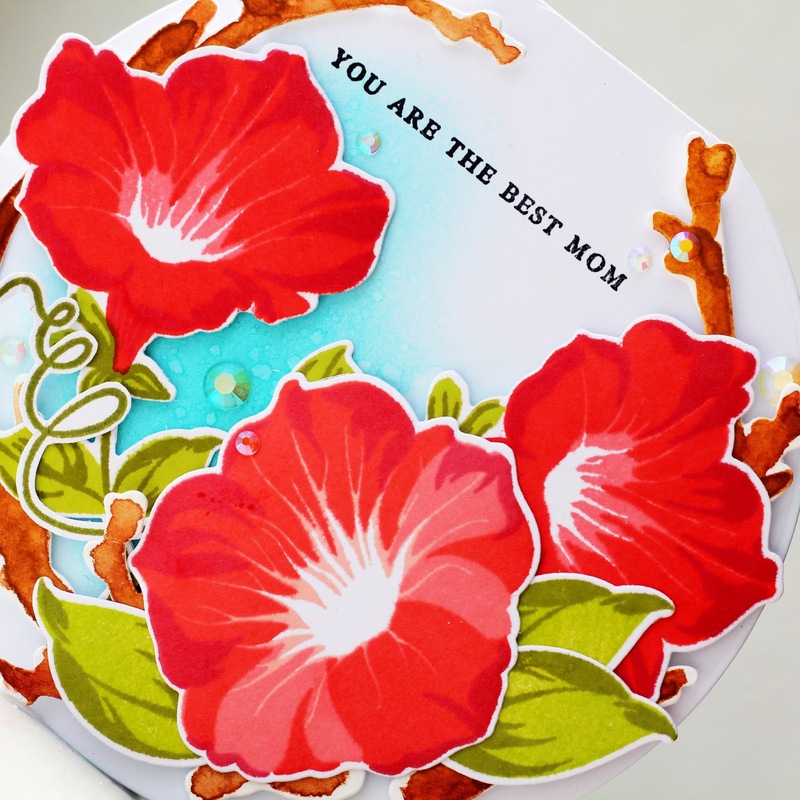 I love the tone-on-tone grey leaves and vines in the background of your first card. That's a beautiful accompaniment to the bright flowers. I also really like the layout of the second card: the circle card was a great idea. Thanks for sharing these great ideas! Pretty colors to the flowers and I like the circle shape on the second one. Such gorgeous cards Olga - wonderful choice of colours and designs. Love this Morning Glory build a flower set.